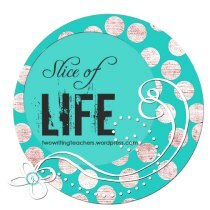 Thank you to Ruth and Stacey for hosting The Slice of Life Challenge. I did the unthinkable today. I left my book bag at school. Typically, I carry it back and forth each day and each day it sits wherever I plop it down until I pick it up the next morning. I feel a little guilty. Even though I usually ignore it after I bring it home, at least I know it's close by and I can get it out if I want to. I left school early for a meeting on value added (yep, it was exciting as it sounds), and then had dinner with friends. I just couldn't bring myself to walk back into the building at 7:30 tonight to retrieve my bag. It felt wrong to walk in the house empty handed, but at the same time, it felt so right. For tonight, I'm going to be mom and enjoy time with my daughter who is home from grad school. For tonight, I'm leaving Mrs. Johnson and her bag back at school. The papers will still be there tomorrow. It just feels right. It sounds right as well -- friends for dinner, time with daughter and husband. Enjoy this lovely evening!!! AMEN! Love this choice! Enjoy every minute!! Good choice! It sounds like it was a great evening. We all need a break from the bag! I feel the same way when I leave my phone at home. Lost and unconnected--but totally good. Enjoy your evening! Maybe you should have a bagless day once a week. Enjoy the evening! Good to know I'm not the only person who totes my bag back and forth each day! I feel the same way on the rare nights I leave my bag at school. I wish I didn't, but I do. And so many nights I don't even look at anything I've carted home with me!